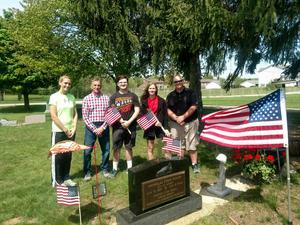 It has become a tradition in Middleville for eighth-grade students to visit three local cemeteries and decorate gravesites with American flags for Memorial Day. Prior to visiting Mt. Hope, Irving and Rutland cemeteries, students learn a little about why Memorial Day is celebrated and the significance of the day. In recent years, the lesson hasn’t been only about the historical facts of Memorial Day in the United States, but also a story much closer to home – the story of Cpl. Nicholas Roush. Sometimes his former teachers tell his story; other times his parents, Bob and Donna Roush, share it with the eighth graders before they visit and decorate Mt. Hope Cemetery where Roush is buried. MS Students to Perform "Little House on the Prairie"
Middle school students will turn back time with the Ingalls and Olsen families in their production of "Little House on the Prairie: The Spelling Bee." There are 37 students involved in the play directed by Vickie St. John. Performances are scheduled at 7 p.m. March 22 and 23 in the high school auditorium. Three Thornapple Kellogg Odyssey of the Mind teams have advanced to the World competition after finishing first or second at the state last weekend. Two teams will represent the high school and one team will represent the middle school. TK also sent three teams to the World Finals last year, including some of the same students who will be advancing this year. Ellie Baranek rubbed her hands quickly together until she felt the heat building up in her palms. The fourth-grader quickly realized her action created friction that in turn created heat. "It's motion energy to heat energy," she deduced. Her classmates rotated around the room to six different stations where they tried to answer the question "How do we know energy is present and moving in a system?" They also gained an understanding of how energy is transferable. Three Thornapple Kellogg Middle School eighth-grade students were named winners in the Elks district writing contest after being named the local winners for Hastings Elk Lodge 1965. This year’s theme for their essays was “Why our veterans are American heroes.” Jacqueline Aguiar, Rozalynn Reaser and Aubrey Bischoff will now advance to the state competition. Winning entries from the state move on to a national contest. Four TKMS Odyssey of the Mind teams will advance to the state finals with two other middle school teams placing at the regionals but narrowly missing the cutoff to advance to the state. Sahara Coston and Cash Rabley won the Thornapple Kellogg Middle School spelling bee honors. Both are sixth graders and will represent TK at the regional spelling bee hosted at TK Middle School Feb. 27. Basic blue duffel bags were turned into brightly decorated gifts to give foster children something they could call their own. Thornapple Kellogg Middle School students donated funds they raised for Veterans Day to the Middleville Veterans Memorial project and the Barry County United Way for veterans assistance programs.